Bcl2 antagonist of cell death (BAD) promotes cell death. BAD competes for the binding to Bcl-X(L), Bcl-2 and Bcl-W, thereby affecting the level of heterodimerization of these proteins with BAX. BAD can reverse the death repressor activity of Bcl-X(L), but not that of Bcl-2. BAD appears to act as a link between growth factor receptor signaling and the apoptotic pathways. 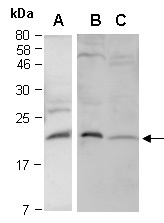 Rabbit polyclonal antibodies were produced by immunizing animals with a GST-fusion protein containing either the N-terminal [BAD (N) (R0221-1)] or the C-terminal [BAD (C) (R0221-2)] regions of mouse BAD. Antibodies were purified by affinity purification using immunogen. (N-terminal); B, C: R0221-2 (C-terminal)] at RT for 2 h.